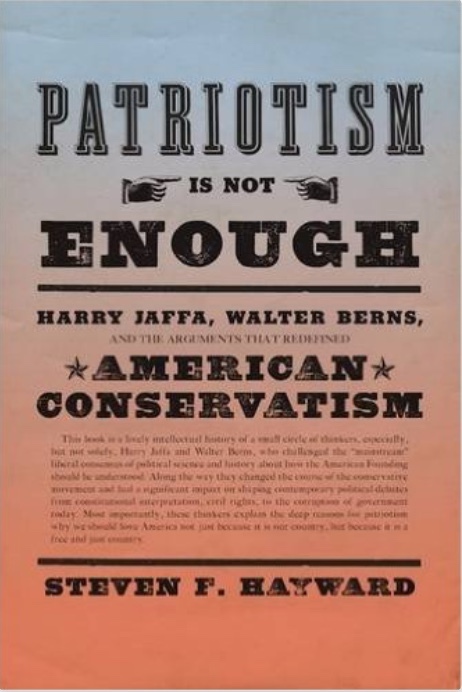 Scott kindly mentioned my forthcoming book, Patriotism Is Not Enough, which will appear in mid-February (though you can pre-order today!). I’m going over the final page proofs right now, and thought I might as well share a couple of previews. My favorite recollection of the Jaffa-Berns feud was the time, around 1985 or 1986, when the chairman of the Government department at Claremont Graduate School, George Blair, announced his retirement, and the faculty left swooped in to try to take over. One of our allies in resisting was the distinguished historian Leonard Levy, then chairman of the History department, and although Levy was an old school New Deal liberal, he was on our side in wanting to preserve the conservative character of the department. Levy sent a note to Walter Berns asking if Walter might be interested in becoming chairman of the department. Thank you for thinking of me, but I must decline the invitation. At the present time, 3,000 miles separate me from Harry Jaffa, and I’m not interested in diminishing that distance by a single inch. Score that round for Berns, I think. Epic academic feuds are common, but often about matters that are trivial or obscure. It is a mistake to explain the Jaffa-Berns quarrel as an example of the narcissism of small differences, or still less the simple pride or one-upsmanship typical of most academic fights that have little consequence to the real world. But the differences between Jaffa, Berns and their allied camps that seem abstract or remote on the surface are connected to a serious question, perhaps the most serious political question of this or any time: What kind of country is America? What is the right or best basis for patriotism? Is democracy capable of being understood and conducted nobly? Above all, can these questions be answered without recourse to pondering deeply the nature and condition of the human soul? Did I mention you can pre-order? Right here.